BLACKFIRE Wet Diamond Waterless Wash 4 oz. Home > BLACKFIRE Wet Diamond Waterless Wash 4 oz. Safe, waterless washing plus shine-boosting polymers! BLACKFIRE Wet Diamond Waterless Wash in the ready-to-use spray bottle gives you a powerful ally in keeping your vehicle clean. This high lubricity waterless wash uses BLACKFIRE's proprietary Wet Diamond polymers to encapsulate dirt and dust so they wipe away with out scratching. Fingerprints and smudges disappear. Meanwhile, the anti-static polymers bond to the paint to reinforce the existing protection and create a whiplash-inducing shine. BLACKFIRE Wet Diamond Waterless Wash is a car wash in a spray bottle! If you washed your vehicle every time a little dust settled on it, you'd be washing it every day! The fact is that our clean vehicles have to face the outdoors and they are going to get dirty, often far sooner than we'd like. To make it easier to keep vehicles clean between washes, manufacturers developed waterless washes. These spray-and-wipe cleaners are quick, convenient, and they do remove dirt... but BLACKFIRE Wet Diamond Waterless Wash goes a step further. BLACKFIRE Wet Diamond Waterless Wash cleans paint and boosts existing paint protection! 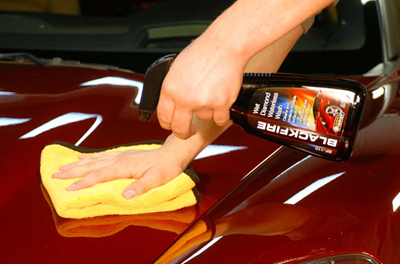 BLACKFIRE Wet Diamond Waterless Wash removes dust and dirt PLUS it protects the existing wax or paint sealant. High impact Wet Diamond polymers bond to the vehicle to reinvigorate the shine and boost the paint protection. These polymers are anti-static, meaning they do not attract dust or dirt. When you use BLACKFIRE Wet Diamond Waterless Wash, the results last longer than a couple hours - they can last a few days because less dirt sticks. Added UV protectants in BLACKFIRE Wet Diamond Waterless Wash keep your paint finish vibrant and rich. BLACKFIRE Wet Diamond Waterless Wash works on paint, clear coats, glass, metal, and plastics. It delivers a just-detailed shine without streaking or clouding. Keep your vehicle looking freshly washed every day with BLACKFIRE Wet Diamond Waterless Wash.
For a superior value, check out BLACKFIRE Wet Diamond Waterless Wash Concentrate! It offers all the same benefits in a money-saving concentrated formula. Safely cleans paint, chrome, plastics, glass, and metals. Dries clear and resists streaking. High lubricity polymers protect surfaces from marring. Work out of direct sunlight for best results. Spray desired surface with BLACKFIRE Wet Diamond Waterless Wash and use a folded microfiber buffing towel to wipe in one direction. As the towel becomes soiled, flip to a clean side. Continue in this manner until the entire vehicle has been detailed. Change to a fresh towel as needed. This size has been discontinued. Please see alternate sizes below.